In 2008, an article appeared in the South Wales Evening Post, penned by someone who had managed to find his way to a new cinema complex, situated at the hub of our unnavigable city centre. He extolled all the virtues of its cleanliness, seating and clarity of image, etc, but then strayed off into territory of which he obviously had no knowledge whatsoever. He compared, in disparaging manner, this new soulless composite with the Swansea cinemas of old, referring to all the picture houses of this earlier period as being scruffy “bug houses”! Like most sweeping statements, such comments are totally worthless. Scruffy bug houses they certainly were not! The generation of cinemas that were built in the thirties, and onwards, offered everything that could possibly be desired by the most discerning of cinemagoers. Some older cinemas may have needed updating but “bughouses”-never! Swansea, and its environs, was blessed with a wealth of fine picture houses and those who remember the magnificent Plaza Cinema will vouch for its excellence and recall, with nostalgia, the handsome theatres of the thirties that appeared in the suburbs- the Maxim in Sketty, the Tower on Townhill, the new Tivoli in Mumbles, etc. Gorseinon, the Hafod, Crosshands, Pontardulais, and many others, had their very own cinemas and each, and every one of them, had a unique charisma and warmth of its own, qualities totally nonexistent in the present day cinema. 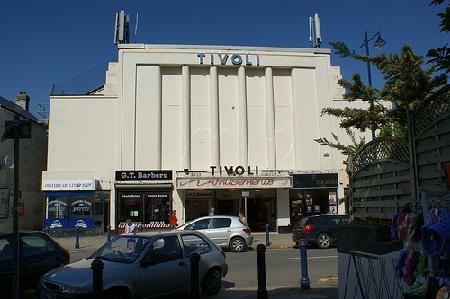 Prior to World War 2, Mumbles had two cinemas, the Tivoli and the Regent. I am told by the great cinema pundit, Fred Grace, that the original Tivoli, (a single storey, tin-roofed, structure), was built and sited in Ilfracombe and was transferred piecemeal to its Mumbles site before World War 1. It had an elegant Edwardian verandah at the front and inside, though shabby was immaculate with a cosy atmosphere and charm. There were a few rows of benches at the front for the children’s matinees and well worn tip-up seats to the rear, which, according to price paid, (3d to 1s.) varied in comfort. The tin roof had a disadvantage in that, during a heavy downpour of rain or hailstones, all sound from the screen was drowned but this added to its character! 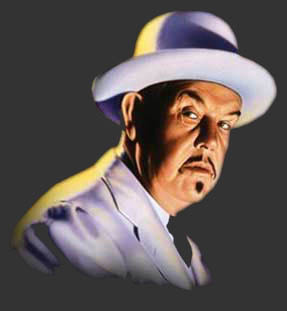 The much loved and creaking structure reached the end of its career in the mid thirties and I was present, on that very last night, to see a Charlie Chan murder film featuring Warner Oland in the title role of the great Chinese detective. We left the cinema with heavy hearts because this lovely old place had been the source of so much good fun and entertainment, as it had been to our forebears. It was like saying goodbye to an old friend. The architect had it just right! The site was cleared with incredible speed and the shape of the new Tivoli began to emerge. Upon completion we realised that now we had a cinema as good as anything, anywhere in the country. A strikingly well designed exterior housed a handsome entrance foyer with sweeping staircases each side to the upstairs circle. Modern, immaculate toilets complemented a spacious auditorium beautifully furbished with drapes, plump comfortable seats, lavish architraves and subtle lighting. I have yet to find a cinema so well designed and perfect for its setting, being not too big to lose the character of a village cinema- the architect had it just right! Mumbles’ other cinema opened its doors in Newton Road in the twenties and was first named “The New Cinema”. As a result the locals now referred to the Tivoli as-“The Old” but within a few years, the owners of “The New” decided to change to the grander name of “The Regent”. This mattered not a jot to the rank and file of Mumbles citizens, dear me no, Mumbles had decided. Whether you like it or not, the two cinemas would still be called- the Old and the New. Surprisingly in the thirties, there was enough support, in spite of the (then) small population, for the two cinemas to co-exist quite happily. Programmes changed mid week and this meant that Mumbles viewers were offered the choice of four, double feature programmes a week. Then came revolution! The new bigger Tivoli opened in the late thirties and the Regent Cinema management decided to call it a day. The Regent ceased to operate as a cinema. Local town councillor (and later town mayor) Harry Libby took over the premises and used it as a warehouse for second hand goods until May 1940. The hall was then requisitioned by the War Office to become the HQ for the Local Defence Volunteers (LDV), later known as the Mumbles Home Guard. This it remained until that gallant body stood down in 1944. From then on, the hall had a chequered career becoming, in turn, night club/restaurant, bingo hall, night club/disco, etc. Finally, entrepreneurial opportunists saw the site better employed in housing an arcade. This was a very successful conversion and remains as such, to the present day. It is not difficult to see the shape of the original Regent Cinema from a viewpoint on the opposite side of Newton Road, all the higher facia of the cinema remains untouched and, and at the rear in Castle Crescent, the whole fabric of the cinema roof and walling can be seen virtually unchanged. A little piece of Mumbles history lives on. The new Tivoli thrived from the word go and continued to do so throughout WW2, playing an enormously important role as a morale booster in those troubled times. The general public and members of the Armed Forces beat a path to the doors of this lovely cinema for a few hours respite. Sadly, with the advent of television, the Tivoli, along with many other theatres, suffered. People chose to stay at home and audience numbers dwindled to a level that made business no longer viable. And so it was that the Tivoli, after affording so much pleasure to generations of Mumbles people, suffered its demise, handing over its mantle, eventually to a false god. Another precious facet of Mumbles life had crossed the Styx. Bingo came to the Tivoli (and went) and, eventually, the gaming machines of the present Amusement arcade took over, to jangle their spurious promises in an auditorium that had once echoed to the laughter and sighs of a Mumbles audience. The days of the village cinema, as we knew them, were over . Well! Just what did the Old and the New have to offer us in those exciting formative years of childhood? What was so special? Of prime importance in those lean days of the thirties was the fact that it was just affordable and with thrupenny bits clutched in grimy hands, children would queue up, feverish with expectancy, outside the cinema under the watchful eye of Mr. Sermon, the commissionaire. Doors opened at 1.45pm for the Saturday matinee. The 3d bit was paid to Miss Foy at her kiosk who greeted all the children by name whilst Alfie Lee, the foyer attendant, would frantically beat the raucous mob into some semblance of an orderly line. Once in the auditorium, usherettes Dolly Chugg and Olive Kostromin slowed down the stampede and directed the children to seats. These brave young lasses were both armed with torches which were used, occasionally, as weapons to subdue over enthusiastic little boys, hence the dents, dried blood and matted hair on the tops of the torches and the permanent dents in most village lads’ heads. Cartoon eg Mickey Mouse, Betty Boop, Popeye the Sailor. Throughout the entire performance there was enthusiastic audience participation and a complete lack of tolerance for anything slow, such as: a love scene, serious music, anything good for us, weeping females, costume dramas, Shakespeare, anything remotely cultural or educational, sweet little girls in bonnets, babies. Disapproval was verbally and uninhibitedly expressed but, such was the respect for Dolly Chugg’s torch, it never got out of hand. Stretcher bearers were rarely needed. The Cinema then closed at about 5.30pm and, presumably, was cleaned and aerated (so necessary in Spring when all the Mumbles little boys and girls were dosed on sulphur compounds “to cleanse the blood”), I firmly believe that the first serious damage inflicted upon the ozone layer dates from this period. Reopened at 6.30 pm for the evening show. the weekly winter meetings in the Victoria Hall for Junior Guild; the Castle Field Fetes and so on. But the bonding experienced in the Cinema audience outweighed all the others by far. Here, as a group, we shared all the thrills and laughter generated by the performance of our heroes. I recall, many times, looking about me and seeing the total involvement of my friends as shadows flickered across their young expressive faces. They were in there living the parts. Such excitement! Such laughter! All shared! of intrepid swimmers leaping off the seawall and the back streets of Mumbles echoed for weeks with the bursts of Tommy gun fire inspired by Paul Muni’s “Scarface” siege, in the streets of Chicago. The cinema was our window on to the world. There were few wireless sets in Mumbles and reading matter expensive and it was in the flickering gloom that we saw famous personalities, events, and ways of life from afar. With great pride, we came to learn just how mighty was our British Empire, far too powerful to worry about the early build up of the fascist countries! Adults, too, benefitted from a few hours before that magic screen. Seated in the shadows of the shabby old Tivoli. the most sceptical of Mumbles viewers would be carried away for a few hours from the daily heartbreaking task of keeping a home going on dole money. This, again, was a bonding experience within the community. Privacy was a rare privilege in the meagre living space of the average Mumbles home. Families were larger in those days and aged parents were always found a permanent place by the kitchen fire, as a result courting couples were rarely alone. The back row in the village cinema was usually the nearest that a couple could get to be close and escape together into a fantasy world for a few hours. Whilst holding hands, or whatever, many were the commitments whispered (and surprisingly fulfilled) in the flickering darkness of our village cinema. Often the first signs of a developing relationship was to see a couple seated in the back row and, as a result they would become the victims of the merciless and ubiquitous Mumbles legpuller. I observed, that as a relationship matured from courtship to marriage, so couples sat nearer the screen, this was probably to make room for the next generation, or perhaps, related to a cooling of ardour. In my case it was through deafness. 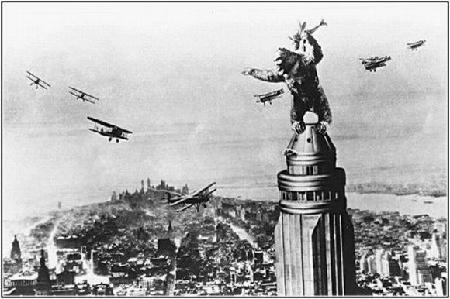 Without realising it at the time, the Cinema had a great moral influence upon us, showing us right from wrong. The “goodie” always beat the “baddie”, The hero was always clean and well groomed, the villain the opposite. The perpetrators of a crime were always found out and punished, or ridiculed. The Church and Christian belief was presented with respect and belief and the thoroughly decent chappie always won the hand of the fair maiden. One mystery I never solved, where did that beautifully orchestrated music came from when they sang to each other in the heart of a jungle or on a boat? I never found out. This moral code reinforced all the teaching we had elsewhere, from our parents, teachers in school, Sunday school, neighbours, police and in what we read. There was no free library in Mumbles until 1936. Books were expensive and the bulk of reading was confined to “penny dreadfuls” such as The Wizard, the Skipper, and those veterans of public school stories, the Gem and the Magnet. Well written, these tales subtly, described a good way of life with the malefactor always coming off second best and hard work and decent behaviour always being rewarded. The Mumbles Cinemas have long gone and as a result, the village lost a precious common meeting ground. Television took that away but sadly the expectancy of a family-evening-at home culture was not fulfilled, on the contrary, in the profligacy of the times a house full of electronic entertainment broke down the integrity of the family unit as never before. The “Old” and the “New” were not just places of shallow entertainment and their influence was not limited by the physical boundaries of their halls, they were an integral part of Mumbles life, where we regularly bonded as a community. I doubt we shall ever have anything like of it again.